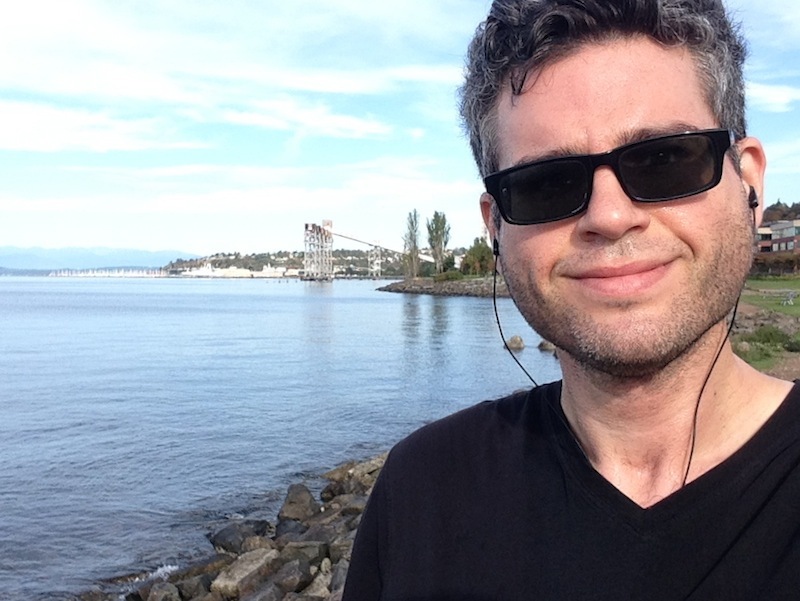 44 Hours in Seattle | Keep It Up, David! Collin couldn’t resist dunking one of his chips in my anchovy vinaigrette. That night, we hung out at Collin’s house, where we made minestrone soup for dinner. Well, Collin made the soup, and I was his prep chef, chopping lots of vegetables, including onion, carrot, celery, kale, and zucchini. 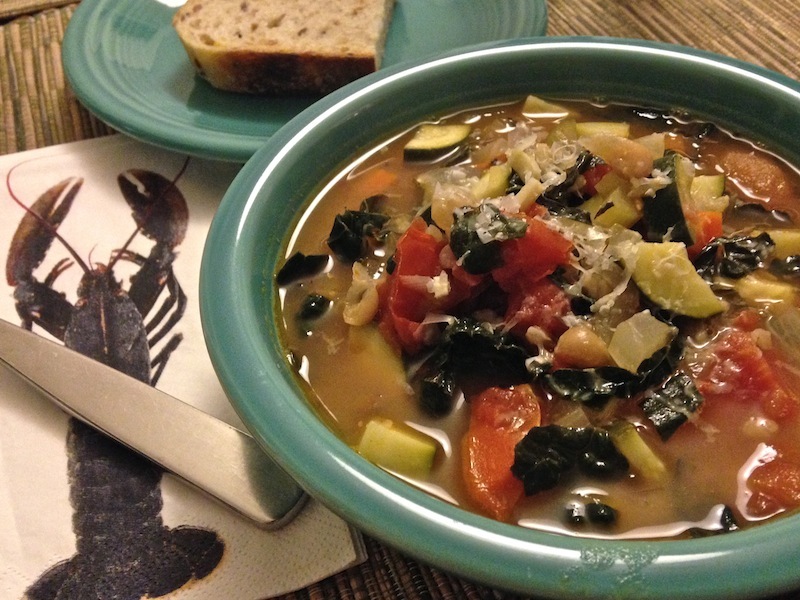 The soup was loaded up with veggies and beans – like a good minestrone should be – and Collin also threw in some brown rice, too. I love Collin’s lobster napkins… turns out he got them at Ikea. Here’s Collin’s fun fact for the day: “Ikea is the best for paper napkins.” Good to know! After dinner we played Quiddler, a card game that Collin bought on Bainbridge, and it was fun, especially for me, because I won. It’s kinda like a mix of Scrabble and Gin Rummy. 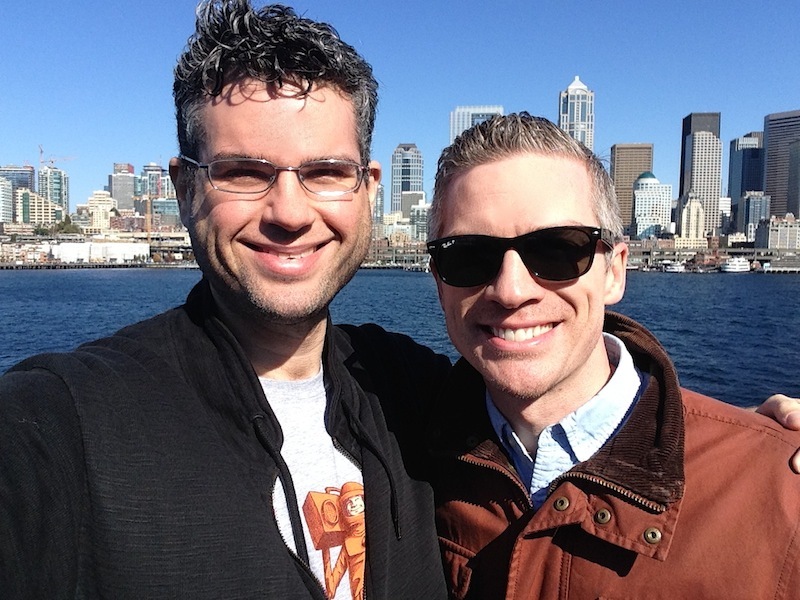 RELATED CONTENT: Check Out More Seattle Adventures! My Race Up the 40-Story Rainier Tower – 4 Times! – and My Visit to Attend Collin and Blayne’s Wedding! I had gotten up early for the race on Saturday, so I slept in on Sunday until 9am, and then hit the road for a run. 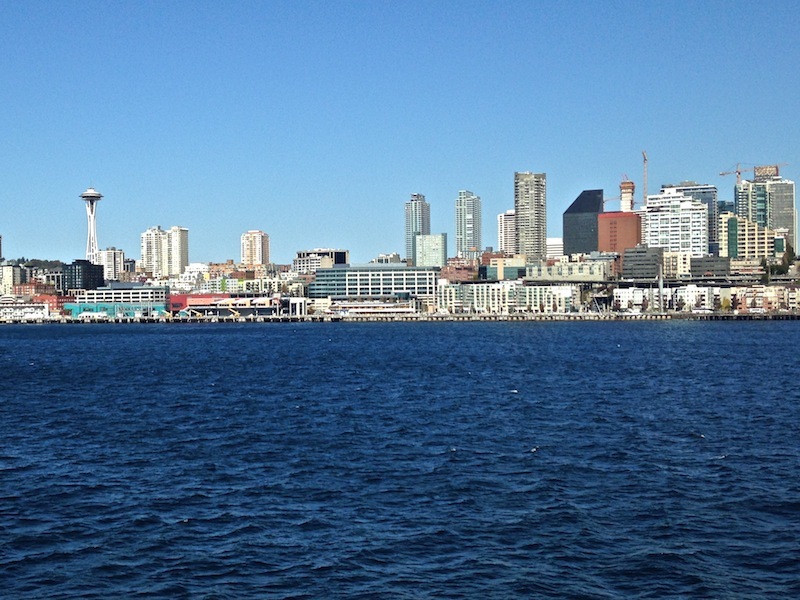 I headed northwest from my hotel, which was two blocks from the Space Needle, not really knowing where I was going. 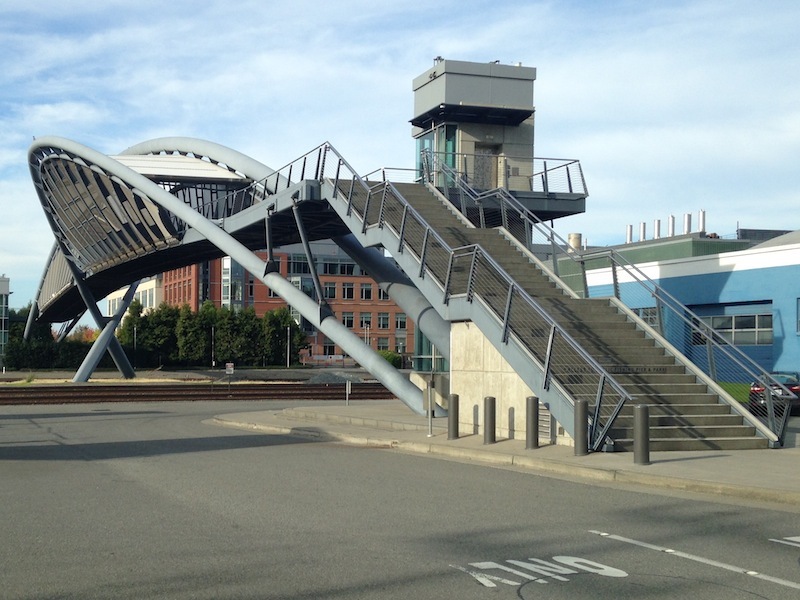 I was on Elliot Avenue when I came across a cool looking pedestrian bridge that went over some train tracks. I later found out that this was the Helix Pedestrian Bridge, but I didn’t know that at the time, and I had no idea what was on the other side. So I crossed it to find out. It’s a beautiful little bridge smack in the middle of a boring industrial neighborhood. I am so glad I crossed that bridge, because I found myself in Centennial Park, a gorgeous waterfront park that stretches for over a mile. I ran back towards the city on a path that followed the water’s edge, and it was a gorgeous morning, and I loved every minute. 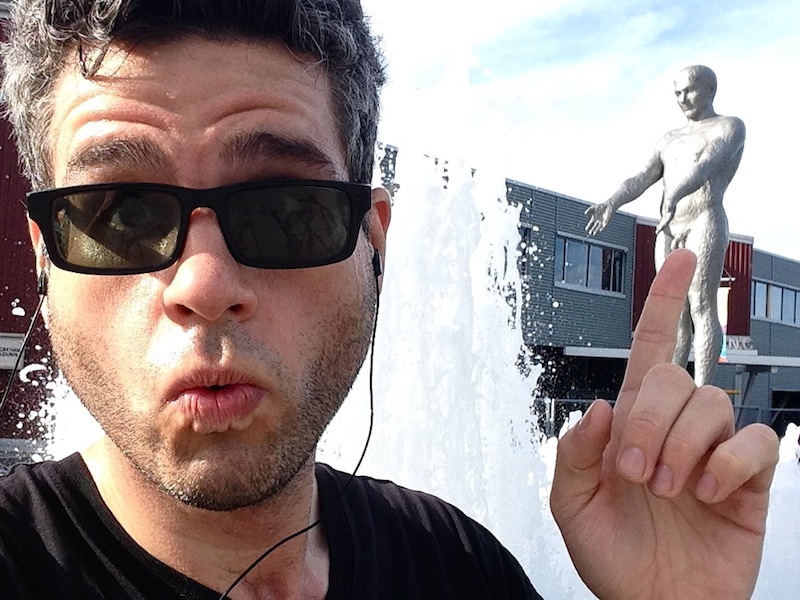 The park led to the Olympia Sculpture Park, where I couldn’t resist touching a naked statue’s dingdong. From there, I made my way back to the hotel. It was a 3.75-mile run – a great way to start the day. After showering and checking out, I wandered over to Portage Bay Cafe, about 8 blocks from my hotel, to get some breakfast. There was probably an hour wait for a table (at least), but since I was dining solo, I snagged the last available seat at the counter without waiting at all. 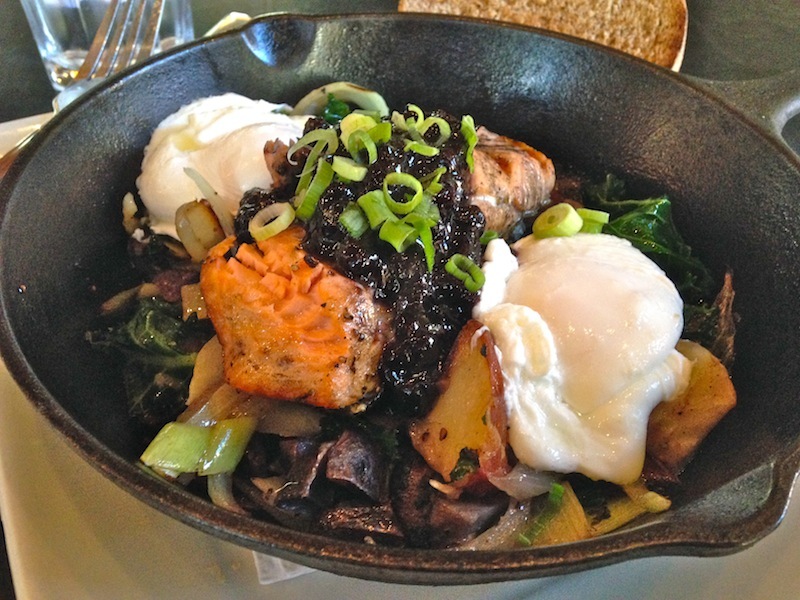 The salmon skillet I ordered was incredible: grilled salmon with a blueberry compote, served over a hash of kale, potatoes, and leeks, with two poached eggs. Are you keeping count? This was my third meal in a row with kale. I do love my superfoods! 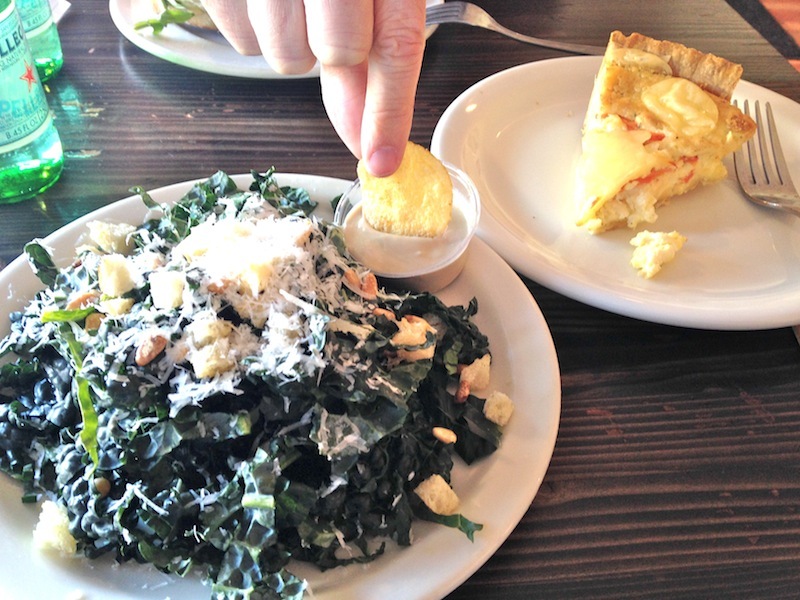 Portage Bay Cafe is all about sustainable, local foods, so they list on their menu where they source their ingredients, and how far away those farms are. The eggs I ate were laid 63.9 miles away! 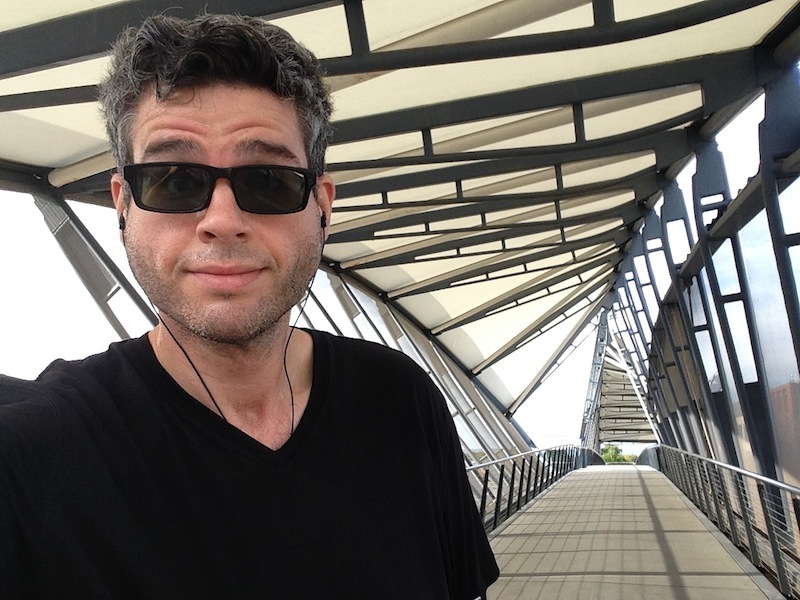 I had about 90 minutes to kill before heading to the airport for my flight, so I wandered downtown on foot, and probably logged a couple miles of walking. Then I caught the train to the airport and was on my way home. I CAME HOME WITH SOME SOUVENIRS! 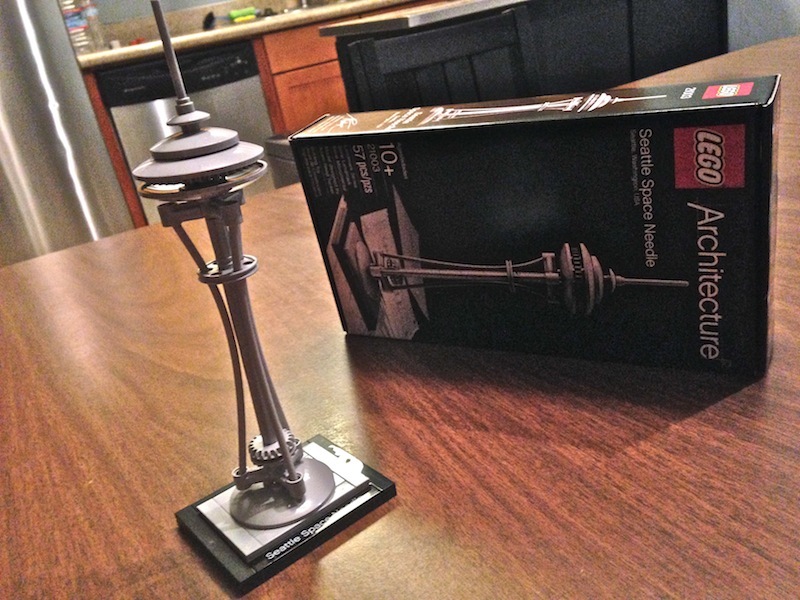 I couldn’t resist buying, at the Space Needle Gift Shop, the Lego Space Needle kit. This is my third Lego set of a tower I’ve climbed. I got the Willis (Sears) Tower set after that race last year, and the Burj Khalifa set after climbing an equivalent number of stairs during a challenge I gave myself a few years back. I also picked up these awesome ear buds at the SeaTac Airport. SHARK EAR BUDS! That’s my left ear. 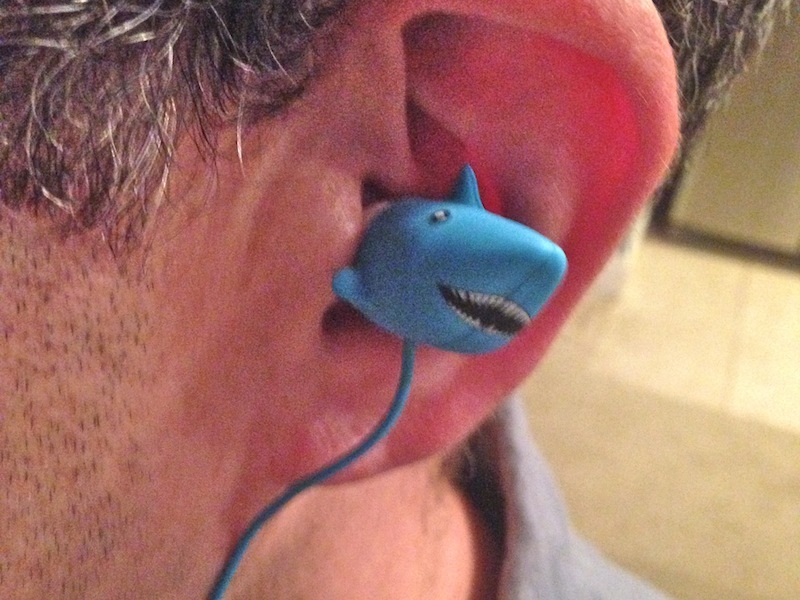 The ear bud for my right ear is a shark’s tail, like it’s swimming through my brain. Pretty sweet! I’m all for anything that can make a workout a little more fun! This entry was posted on Thursday, October 8th, 2015 at 1:47 am and is filed under Uncategorized. You can follow any responses to this entry through the RSS 2.0 feed. You can leave a response, or trackback from your own site. Looks like a great weekend, David. Fantastic pictures, as always. Now it’s one of mine, too!